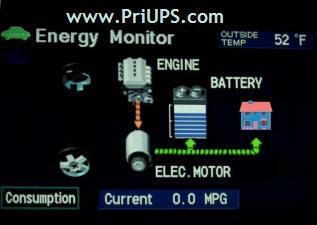 Gasoline-electric hybrid vehicles can serve as a UPS (Uninterruptible Power Supply) for your house. The Prius, unlike the generator, also has a battery that provides instant, UPS-like power, to your house. Careful research has shown that most* people would prefer not to go outside to manually pull a cord in the case of a power failure. The same independent research foundation,** using accepted methods of sampling and polling***, determined that most* people would prefer not to spend money on a big, expensive generator, even if they don't have to pull on the cord. Grid-related benefits None None Maybe! Maybe! The "cost" for the Prius, obviously, does not include the cost of the vehicle itself. If you don't have one and don't plan to get one, "never mind." If you are thinking of getting one, here's another reason to add to the gasoline-saving and environmental benefits. If you already have one, well then, it won't cost you anything, will it? 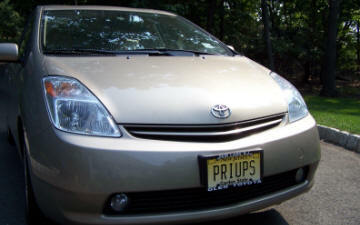 This site is dedicated to the concept of Prius-As-Powerplant. If you've only got a minute, read the "Executive Summary"
If you're keen on hybrids, energy savings, technical babble, and saving the world, Here's the rest of it. What's really really new, at least for now? Here's a general update for December 2017 a full decade after the main PriUPS project was completed. Here's a BONUS! April 2006 - "Driving Around" power - from 1 to 3kW (or more)! Press notices, including some nice items in the NY Times and a small feature in Wired Magazine. With trepidation and against advice I've added my BLOG to this web site. It changes frequently, so if you don't like it today, just click "yesterday" and see how consistent I can't be. May 2007: I've heard from others who are working on their own PriUPS projects, and I've devoted a new section to my fellow strivers.